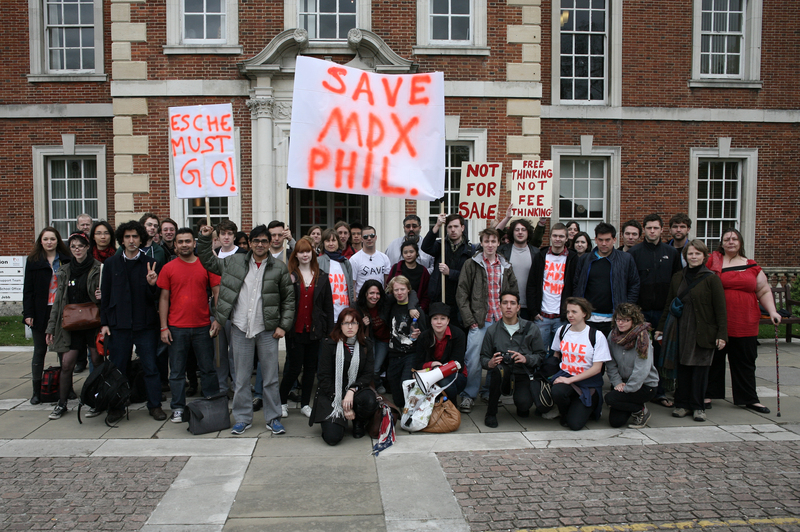 Yesterday there was a spontaneousÂ occupation of the boardroom at Middlesex University after Dean of Arts Ed Esche failed to attend a meeting arranged withÂ protestersÂ against the closure of the philosophy department. Around 45 people moved into the room. The police were called by the university, but found no grounds for eviction of theÂ protestorsÂ or arrests. Â Some entirely fatuous claims of assault and destructive behaviour were briefly levelled at theÂ protesters; even the police dismissed these charges out of hand. It took some time before the decision to extend the occupationÂ indefinitelyÂ was made. However, initial fears by some of the occupiers gave way to an increasing determination and radicalism; eventually the decision was made with a near complete consensus, despite earlier splits suggesting a walk out at 6pm. There were further debates regarding what the demands of the occupation should be. Some suggested placing a demand that Ed EscheÂ fulfilÂ his promise of a meeting to end the occupation; others suggested proposing an independent review to determine the fate of the department. Ultimately, these suggestions were defeated in favour of an open ended occupation emphasizing the key demand of no closureâ€”not as a condition for the end of the occupation, rather as a reason for the occupation as part of the protest movement. The challenges ahead involve further publicizing theÂ campaign, bringing more students and academics from other departments on board, and forging links with other student and anti-cuts campaigns. 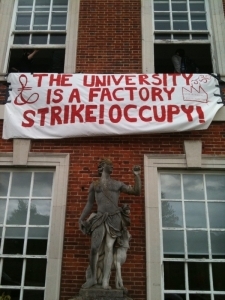 Yesterday (Wednesday 4th May) there was a rally at the other campus and also a party on the ground floor of Mansion House at Trent Park. Last week, we were invited to a meeting with Dean of Arts Ed Esche and Deputy VC Margaret House at 10.30 on Tuesday 4th May (the day before our deadlines), to address our concerns about the closure of our Philosophy Department.Â Rearranging our commitments at great inconvenience to ourselves, we arrived at the campus for the meeting, only to find it that they had cancelled it the night before. Security attempted to stop us entering the corridor and called the police, however the police decided to take no action. The students are now sitting in the board room (around 5 feet from the Deanâ€™s office door), waiting for the Dean to show up and address our concerns. Students are unanimous in our demand: allow us the meeting you promised us.Â We have voted unanimously to remain here in occupation in protest of the refusal to meet us. Come to the Middlesex solidarity party this evening! Trent Park, 4:30. Free food and drink too!! Directions to the Middlesex University Trent Park campus. which is the penultimate stop (zone 5), heading north. between Oakwood station and Trent Park. The service runs every fifteen minutes between 7:00am and around midnight (or around 10pm, during vacations). The bus stop for the minibus is to the left of the exit to Oakwood station, on the same side of the road. You’ll find a basic map atÂ http://www.24-7.mdx.ac.uk/Exam/docs/Map%20to%20Trent%20Park.doc , and a more detailed one atÂ http://www.streetmap.co.uk/newmap.srf?x=529250&y=196750&z=1&sv=529250,196750&st=4&ar=N&mapp=newmap.srf&searchp=newsearch.srf.